Earth Mantra welcomes back Reese Burgan, who this time has for us a momentous album called Eighth Day that defies easy description. Unlike some of his previous releases that flirt with downtempo electronica and other rhythmic forms, this time Reese delivers a collection of pieces that leans away from beats and rhythms, focusing instead on pure sound construction and compositional sophistication. But calling this music merely 'ambient' feels terribly inadequate, for in it Reese has somehow fused elements of mood music, drone, dark ambience, old school electronica, and experimentalism - all with an undeniable air of symphonic classicism. Really, one must hear this work to understand what we are talking about. What we find most remarkable about this album is the strength of composition. Clearly a tremendous amount of planning and forethought went into the development of this exceptional release, for the compositions themselves are simply out of this world. Reese has always had a great ear for sound design and has always approached composition with his own unique voice, but his few years of formal training have obviously already begun to pay off. As one listens, one can almost see the sheet music scrolling by and one can almost visualize the ensemble of players on stage, locked in fierce concentration, interpreting and performing the complex score. Truly impressive work. Like his previous Earth Mantra release The Beginning of the End, Reese continues to explore religious themes, this time attempting to provide nothing less than a soundtrack for the entirety of the universe's history, from beginning times all the way to the end of days, and beyond. For listeners interested in diving deeper into the meaning of the album, Reese has included a poem alongside each individual piece which helps refine Reese's intent for each, a really nice touch. But irrespective of thematic impact, the music of the album stands for itself and speaks loudly with a unified, cohesive voice. All in all, a dramatic and thrilling collection of electronic compositions that we think will appeal to a wide audience indeed. 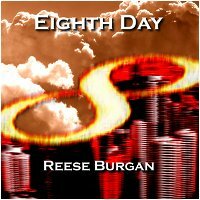 So it is with great pleasure that we welcome back Reese Burgan and unveil his latest creation Eighth Day. A singular work by an artist with a bright future indeed. Highly recommended.